Warning: I've spent a lot of time perusing deviantart.com lately, so you should expect a number of upcoming posts to focus on fabulous game-related drawings and the like. 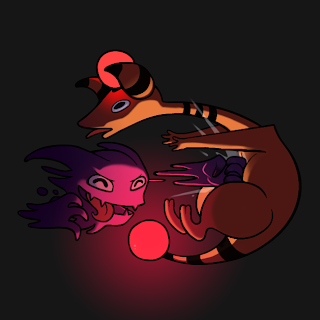 Cases in point: the following Pokémon illustrations, produced some time ago by Matthew Elliott (aka pseudonymjones). "Team Rocket Grunt F + KOFFING"
I came across the pieces above after stumbling across Elliott's take on everyone's favorite closeted game character, Tingle, by the way. Check out that illustration here, and check out his tumblr (which he seems to use more than deviantart these days) here. Me, too :) Of course, how could you *not* like it, right? 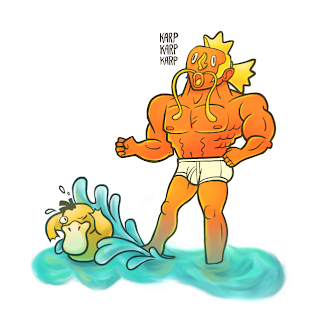 That magikarp illustration is brilliant. I love how his obliques look like scales. You know, I didn't notice that until now, Justin. Brilliant! Ha ha! I understand. I like him, too, by the way--mainly because I think he's kind of cute. Also, he sort of reminds me of the main character in Mizubaku Daibouken/Liquid Kids.